Updates about my work and other interesting arts and activist happenings. This show is an earnest and admirable production by a talented artist who uses costumes brilliantly, as if they were puppets, and uses puppets brilliantly, as if they were costumes. Eppchez! is engaging and intelligent, and owns air space like a second, more-comfortable home. Publik Private is a fascinating, educational, funny, and empowering story of two figures whose vibrant, adventurous lives prove that the world has always had people who defy typical gender roles and identities by living their unapologetic truths. The infernal and the saintly collide in a bold intertwining of two adventures too wild to be fictional. Publik Private is a show that smashes the binary in more ways than one: out and passing, chaste and carnal, pacifist and warmonger, hero and villain, thwarted imperialist and well-intentioned gentrifier. With a wry smile, Eppchez dances between the polar opposites of these two trans lives, and joins them together in something tender, irreverent, and all too human. 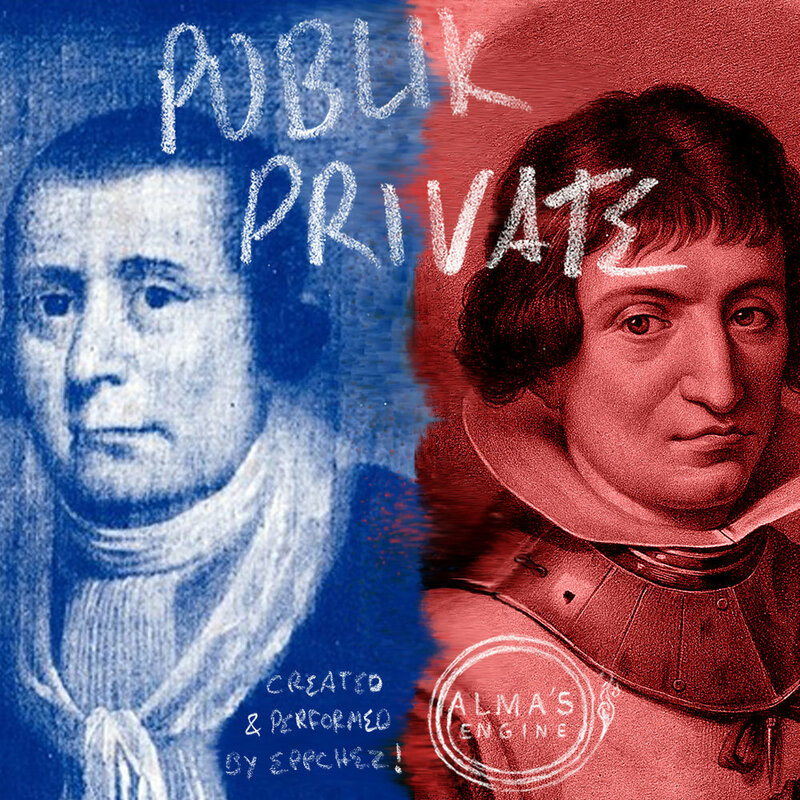 Publik Private, the SoLow Fest entry from Alma’s Engine, explores two historic figures who transcended the limitations of gender within strict social structures. Multidisciplinary performer Eppchez ! creates an onstage documentary reflecting on the lives of the Publik Universal Friend, an agender Quaker prophet from Rhode Island, and of Le Monje Alferéz, a Basque lieutenant who fought to colonize the new world in the name of the Catholic Church, despite being seen by his family as female and exiled to a convent. The descriptions of these characters matter to Eppchez ! (a nonbinary performer who uses the pronouns ey/eir and ! in place of a last name), who wonders whether ey will be remembered on eir own terms, as the Friend and Lieutenant were not. Publik Private debuted at the Rotunda as part of RE(focus) Fest2018. The show has an intimate feel and therefore plenty to work against at Panorama Philly, an engulfing, un-air-conditioned warehouse up several flights of stairs. SoLow Fest does a great service to younger and nontraditional performers by creating a platform encouraging experimental work with low financial risk. The festival, run by a small group of dedicated and overworked volunteers can’t offer resources such as space and funding, which makes SoLow shows universally scrappy. Publik Private offers many examples of how limited resources can lead to truly creative solutions. Lighting designer Evelyn Swift Shuker works wonders with eight tiny instruments, three of which are clip lights. In a particularly inspired move, Swift Shuker rigs a black curtain over a warehouse window that can be raised and lowered, flooding the space with natural light for scenes where the Publik Universal Friend preaches, a subtle nod to the Quaker doctrine of the inner light. In the same way, the use of recorded voices overcomes the sound-sucking space, and a screen on which translations are projected serves as an inclusive solution for non-Spanish-speakers at the bilingual show. Puppet and costume designers Mila Romero and Gwendolyn Rooker create highly functional, durable, and evocative costumes that Eppchez can step into and out of, transforming into eir characters completely. Because the costumes are constructed as puppets, Eppchez can half step out of them and converse with a character while also embodying them. In one particularly moving moment, Eppchez slips one hand through the sleeve of the lieutenant’s costume and regards it, considering a murder Alferéz has committed. As a content creator, Eppchez ! is deeply thoughtful. Ey is rigorous about considering the characters’ stories in their full complexity. Often, however, the work gets too cerebral and an audience with no prior knowledge of these figures loses the thread. More show and less tell could make the script more engaging without sacrificing the integrity of eir ideas. With no interpretive tension between words and actions the experience stagnates. Eppchez seems unwilling to incorporate eirself into the story, which is unfortunate. Ey introduces eir multiple identities at the top of the show and exists as a presence addressing characters as “you,” throughout, but Eppchez’s place in the show remains unexamined. Publik Private hasn’t yet found the clear narrative or thematic throughline that holds it together and pushes the action forward, but the work overflows with interesting ideas, arresting visuals, and clever solutions. SoLow provides a chance for groups like Alma’s Engine to experiment, but this work needs and deserves more support, not only for the new stories and perspectives it offers but because of the raw talent of its creator. Publik Private, Eppchez’s contribution to the 2018 SoLow Fest, is an exploration of people navigating their identities within the limitations of the social structures of the past. In effect, these trans, nonbinary, and Latinx characters are the performer's ancestors, but the show isn’t a veneration. Publik Private delves into two lives. Those are Le Monje Alferéz, a 16th-century Basque nun who escaped the convent and lived as a man, ultimately earning the rank of second lieutenant in the Peruvian army; and the Publick Universal Friend. The latter was born Jemima Wilkinson in 1752 and, after claiming death from fever in 1776, came back to life as the Friend, an agender Quaker prophet. The show is coming to Panorama Philly in Kingsessing, June 19 through 23, at 6:30pm. It’s created and performed by Eppchez (who also provides projections and sound), with puppets by Mila Romero and Gwen Rooker. Gil Johnson directs. Sidestepping the temptation to create flawless heroes, Eppchez emphasizes that although eir characters lived courageously in some ways, they were problematic in others. Le Monje Alferéz, Eppchez points out, completely bought into European and Catholic supremacy and fought violently to uphold them. Ey describes the Friend, an early abolitionist and advocate for equality, as nonetheless an “obnoxious person” obsessed with piety. The way that we all shift between the role of oppressed and oppressor is a timely theme. REP Radio podcast with Eppchez! 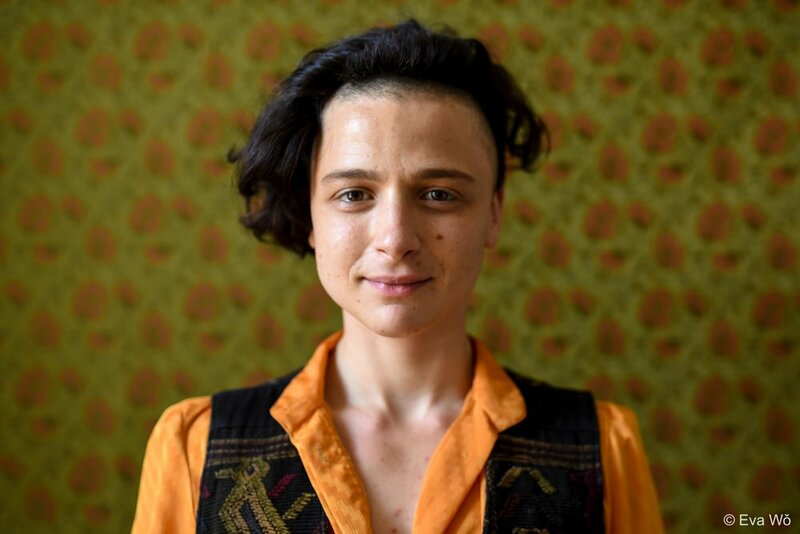 Eppchez!, who plays Max in Simpatico Theatre Company's production of Taylor Mac's Hir, is a nonbinary transgender Latinx performer who brings a wealth of talents to Philadelphia. An Amherst, Massachusetts, native, Eppchez! (who uses the pronouns ey and eir) has worked with Pig Iron Theatre Company, the Mediums, and other groups with a focus on devising new work. Ey studied theater and writing at Wesleyan University. A playwright, choreographer, director, designer, puppeteer, songwriter, and vocalist, ey is also artistic director/conductor of Alma’s Engine, a process-focused creative ministry and self-producing platform for realizing eir work in music and theater. Among eir works is the album Self-Realized-Nation; A Song Cycle of the Occupation (2013), the original plays Junk Redemption (2012) and They Extract! (2014 and 2016), and a site-specific musical staged in Bartram’s Garden, Train-ing: A Duet (2017). note: these are all written by cisgender writers intent on pandering to the alt-gender skeptical. All of this makes Hir quite a challenge to perform—here director Jarrod Markman negotiates it with assurance and high-style. As Paige, the great Marcia Saunders is beyond praise. It’s an acting class simply to watch her navigate the shifts in tone with a surgeon’s precision. She can start a line with the sunny boisterousness of a morning show co-host—and, by the end of it, turned chillingly authoritarian. Simply amazing. Kevin Meehan (Isaac) is very touching in his quieter moments, but I wish he’d tone down some of his smirky comic delivery. Caustic and funny in equal parts, Taylor Mac's "Hir" doesn't bend gender as much as stab it to death with blunt barbs. In a Simpatico Theatre production that opened over the weekend, "Hir" is also forceful, with a four-person cast that shines amid the characters' absurdities. You don't have to go too far into "Hir" to discover its weird sensibility: The first minute of the show will do, when the lights come up on Christopher Haig's set with clothes strewn all over the place and furniture that appears to come from a third-generation yard sale. In this junky house – we see the living room and the kitchen -- there's so much piled against the inside of the front door that Isaac (Kevin Meehan, in a standout display of bewilderment) can't get in. He has to enter through the back door in order to make his first appearance home after three years of picking up body parts in his wartime job in the Mideast. Here's what he sees: A mother (the fabulous Marcia Saunders) who declares "We don't do order!" and crushes a slurry of pills and estrogen in a blender for her stroke-addled husband (John Morrison, fully into the part), whom she despises for his formerly uber-male characteristics. Isaac can't believe what she's done to his dad. The man sits in a drooling position at a cardboard box, is dressed in a women's nightie and wears a clown wig and overdone rouge (Levonne Lindsay's costumes). But this homecoming's not yet complete. Where is Isaac's sister? "Max!" his mother hollers, "come in here and explain your ambiguity to your bother!" Eventually Max does. She is now a trans-gender he, on heavy doses of testosterone and insisting on the linguistic trappings of gender neutrality. In this household, he and she will now be ze. And him and her will be hir. Max is played by Eppchez!, the exclamation point being part of the name. The actor is self-described on the Web as a "Quaker, ungender, Latinex artist and activist." Eppchez! had me glued to every eye-roll and move, first for the gender switch the performance perfectly exploits in the service of "Hir," but then for the way it captures the rich contradictions of a teenager who's always trying on new ideas. "Hir" is directed by Jarrod Markman, who clearly had choices; you could read the script in different ways, each eliciting distinct reactions. Markman chooses a storytelling that makes the play funny, sad and angry all at once – you may be laughing one moment, then zapped by some strange avowal the next. However you react, you can't help but wonder what will happen next. Leave it to Taylor Mac, the genderqueer phenomenon who created one of the most ambitious works performance art has ever produced — the 24-hour-long A 24-Decade History of Popular Music — to look back at the kitchen-sink drama via judy's 2014 play Hir, with a similar mix of disdain, hope, pity, horror, and humor. With just two plays this season, the other being Martyna Majok's bleak yet humorous immigrant drama Ironbound, Simpatico Theatre Company hit the topical jackpot. Turning judy’s incisive eye toward the 21st-century nuclear family, Mac takes a pinch each of O’Neill, Albee, and Shepard — and never, ever softens for the sake of nostalgia. Judy certainly believes in the tenet that you can’t ever go home again, as Kevin Meehan’s Isaac — a dishonorably discharged young Marine returning from a three-year stint picking up body parts in Afghanistan for the military’s Mortuary Affairs unit — quickly discovers. As it happens, that home is so strewn with dirty laundry and dishes that Isaac must enter through a rear patio door (set design by Christopher Haig). In his absence, his father Arnold (John Morrison), a tyrannical, abusive former plumber, suffered a stroke and now stumbles around the living room drooling in a pink dress, blonde wig, and garish makeup applied by Isaac’s mother, Paige (Marcia Saunders). Paige, now free of her husband’s oppression, has staged her own feminist revolution by refusing to clean, drugging Arnold daily with estrogen, working at an environmental nonprofit, and homeschooling her younger child, teenage Max (Eppchez!). Little sister Max is now Isaac’s brother, identifying as transmasculine and using hir pronouns. Some homecoming. If that were it, if this were just a quirky family navigating a new dynamic, it would still be an interesting and funny twist on a timeworn genre. But that’s not it. Oddly, this play perhaps best represents the fears of both the white, working-class Trump voter and the vanishing middle-class liberal. What happens when the kind of man who learned a trade, got a job, and ruled his roost with an iron fist no longer finds a place in the world? What happens to feminists in a gender-free future? Is freedom even possible for someone like Max, whose own history contains so many confusing and painful messages? Director Jarrod Markman plays act one for laughs, setting us up for the damage to come. And come it does — does it ever — but not in a Shakespearean bodies-littering-the-stage fashion. This damage goes deep and stays there. There’s much discussion of parts: those collected by Isaac after battle; a museum exhibition featuring Saint Theresa (but since parts of her were stolen, Paige explains, “they only show the tidbits”); and the pieces Max wants to restore, ignored or overlooked “hirstory,” such as the conjecture that the Mona Lisa might really depict Da Vinci dressed as a woman, a dangerously transgressive act. What powers it all is the strength of this quartet of actors. Saunders whiplashes Paige from whimsy to ferocity, one moment gleefully explaining the new generation of pronouns, the next reducing her husband to whimpers with a look. Morrison gives a shockingly brave performance, humorous and horrible. Though Paige tells Isaac, “Don’t pity him, those that knew him know of his cruelty,” he’s so pathetic it’s inhuman not to. Meehan, who, perhaps not coincidentally, also appeared in InterAct’s production of Young Jean Lee’s Straight White Men, brings a determined force to Isaac, appointing himself man of the house where nobody asked for one. Most playwrights whose work features a transgender character would make that person the fulcrum of the plot, but not Mac. Here, Max is just a confused kid looking for guidance among the wreckage. Eppchez!, with patchy peach fuzz on hir face, an ambiguously gendered physique, and gender-neutral clothing, gets enthusiastic but always holds an air of the slightly lost and frightened, like a puppy hoping to follow the right person home. Isaac’s not that person. He made the mistake of going home again, a man in a place that needs no men. When his mother tells him, “It’s why we sent you, all the boys, to the wars to begin with,” you can’t help but see the factory-line assemblers, coal miners, steelworkers, all those who used to work with their hands and now hang out unemployed and aimless in neighborhoods like these, inside their parents’ houses. But coal’s not coming back, and people in this brave new world continue to follow a dying paradigm. Taylor Mac, it seems, believes the gender binary just might be to blame for at least part of the decline of the American dream; I think judy makes a pretty good case. Da Vinci Art Alliance explores LGBTQ identity with How Do I Look? A question with many layers and points of view explores the historical perceptions of the LGBTQ community in the exhibit How Do I Look? Shifting Representations of Queer Identities. The works in the exhibit, including paintings, drawings, photography, and some 3D pieces, will reflect on how artists answer many questions: How do I look at others? How do others look at me? Does making an image of another reflect the maker? Do we hide behind a mask — would we know if we did? How Do I Look? Shifting Representations of Queer Identities is on display at the Da Vinci Art Alliance (704 Catherine Street, Philadelphia) January 18-29. Gallery hours are Wednesdays from 6-8pm and Saturdays and Sundays from 1-5pm. People are saying such very nice things about They Extract! Eppchez is an insightful and hilarious writer-director, and the actors had me gutturally guffawing for much of their performance. "They Extract!" is a show that stayed with me long after I left the theater. Super on the fringe narrative based theatre. beautiful DIY feel with A LOT of heart. This is a type of story and way of story telling that you won't find anywhere else in Philly. Just check it before its short run is through! What if we explored the dialectic between capitalist exploitation and our drive for human connection, on stage, with a myriad of tools of theatrical exploration masterfully employed, and with good humor to boot? We might have a damn beautiful mess of a play is what. A thing recalling Kubrick and Bollywood and Chaplin and American Melodrama and youtellmewhatelse.. And I suspect, a thing which will echo in new Philly work in the coming years as audience-creators gleefully steal elements from it. Extract, even. ...every aspect of it (the acting, writing, powerful simple set with evocative lights/projections/shadows) is absolutely wonderful - simultaneously heartwarming and terrifying. I left feeling inspired and exhausted in the good way. Emotional labor, romantic love, familial love, loss, trauma, obligation and exploitation, bodies...still thinking about it this morning. Trigger Warning: This review avoids mentioning trans characters. Just another example of a Cis-perspective more comfortable with erasing trans identified people than dwelling on what it means to represent trans people - with our trans bodies - in art. They Extract! a triumphant opening night. They Extract! is now up and running! Opening night was delicious. I was surprised by the laughter. An audience brings so much to the performance. I forgot how funny and moving this piece can be, and feeling relieved that this work is out of my head. Author’s note: Alma prefers to be referred to by using the gender-neutral pronouns "they/them/their." Alma Sánchez-Eppler, a playwright and recent Philadelphia transplant, is embarking on an experiment to demystify the creative process. Alma was frustrated with what they called the “black box” of the creative process, in which an artist goes in and art comes out. The art doesn’t tell the story of the creative process, of the actual work an artist puts in to make a finished product. In an effort to gain a sense of their own creative process and allow others to see beyond the finished artful product, Alma is letting transparency be their guiding principle as they work on their play, They Extract!, so that others may be able to get a glimpse of a creative process. “I’m trying to be as blatant about what it means to create as possible,” Alma said. They Extract! is an experimental play about love as a commodity. Its characters learn to harvest love as an energy source and experience changes as a result. Alma wrote the play as a college junior two years ago, and just last year, they produced and directed a live performance of it at Wesleyan University (you can watch a video of the performancehere). Not ready to part from the world of the play, Alma committed to spending more time with the script and revising it. This experimental transparent creative process, announced on October 9 via a Facebook status and a post on their website, is the means through which Alma is once again getting involved with the play. Alma has put the complete text of the play up on Google Docs so that viewers can watch them edit. Alma is tracking their own thoughts, questions, and tinkering of all sizes — including thematic ideas they’re wrestling with and word choices — on Twitter as well. Alma hopes to not only gain awareness of their own creative process, but also allow others to see beyond the finished product and realize there’s no magic in creating something, just work ethic, or what Alma calls sticktoitiveness. Alma worries that the opacity of the creative process discourages potential creators from actually creating, since they might be under the impression that either you possess genius (or inspiration or magic powers), or you don’t. Have you ever read a book and thought I could never write anything as brilliant as this? Alma would tell you that you could, but it would take hard work — the the book didn’t start out brilliant; as readers, we just don’t see the evolutions of the drafts before the published draft. “I want to share what my process is like so that other people know that it’s possible to have a process,” Alma explained, “and that it’s messy finding what it looks like, if you ever find what it looks like.” These ideas have been percolating in Alma’s brain for a while now. Several years ago, Alma had a similar project in mind to upload to their website different versions of songs they wrote and recorded as the songs were revised and polished. Alma only ended up pursuing that project halfheartedly, but They Extract! provided an opportunity to fully try again. The Internet, with its free, wide audience and its ability to connect people, inspired Alma to start this experiment. Whereas some writers must back away from the Internet as they write in order prevent distraction, Alma is leveraging the Internet as a useful tool for productivity. People on the Internet can observe Alma at work if they choose to, and Alma can use the people as a resource. Although Alma recognizes connection over the Internet is not as valuable as face-to-face connections, they look forward to hearing the reactions and getting feedback from those who might be following the Transparent Creative Process project. Allowing strangers to be their collaborators in this way is a challenge for Alma, who usually prefers to work alone and considers their shyness to be a barrier to asking for feedback. As for people trolling the project? It’s happened once already, but Alma knew the troll and resolved the issue over email. “But no one is really watching now,” they told me, noting that the experiment won’t feel real until people know about it and begin to tune in. Alma’s potential for self-consciousness here suggests that maintaining openness will be a challenge once people start looking at the play, commenting on the Google Doc, and tweeting at them. And although Alma’s passion for the play and for playwriting is propelling them along for now, an important motivating factor is having their progress in public. “No one would notice if I didn’t tweet that day, but I would notice,” they said. Without any rules as to how to go about the experiment or a deadline to finish the revision process, accountability to an anonymous, at times imagined public is helpful. Since Alma’s trials and errors, work habits, and revisions will be on public display, the performative element of the experiment becomes an issue. This experiment could be defined as performance art, which prods the audience to ask: How might a creative process be an artful product in and of itself? Does the product of art mask the vulnerability that is actually found in the creative process? What effect will this experiment have on They Extract! and other creative projects Alma undertakes? The transparent creative process also brings into question the distinction between private and public spaces: is Alma working in public if no one is watching, or are Google Docs and Twitter, though accessible to others, inherently private to them? Does Alma completely own their work if the play is out in the open, on corporate social media platforms, with the potential for crowd-sourced feedback? Alma will consider these questions and many more during the course of the experiment — that’s part of the fun and part of the reason they are not setting any hard expectations about what to take from the experiment. Alma has little control over how the experiment will go, anyway — will people interact with Alma through the experiment as is Alma’s hope, take a peek to merely satiate their voyeuristic tendencies, or just ignore the project? Maybe you can help answer that question if you watch Alma’s creative process unfold.